My pre-holiday weekend continued today with a few indoor chores and a couple of outside stops. Full disclosure: I was going to have a Lame Post Friday, even though technically Wednesday was my Friday this week, and I make no promises about how lame this post will be. Then again, do I ever? It was pouring rain this morning, so I did not go running. I know, some people run no matter what the weather, but I sometimes let myself off the hook. Later on I went for a walk, which was nice. It is much easier to dodge around the puddles and not get sopping wet from the thighs down if one moves at a slower pace. So at least I got some exercise. Before my walk, I got out to a couple of non-local non-distinctive stores, hoping to beat the crowds. I guess I did to some extent, although I kept getting in people’s way. They were all very nice about it, which I chalked up to the time of year, although I have observed that many people in this area are nice at all points in the year. At home I did a load of laundry and made a couple of Christmas treats Further full disclosure: many indoor chores remain to be accomplished. Later on, Steven and I went to the Herkimer County Historical Society, one of our favorite places, for further Christmas shopping. From there we drove down Main Street and parked in a handy space to go to three cool places: Rose Quartz Stand, the European Deli, and Click’s Cakes. I’ll have to write better blog posts about all four of those places (preview of coming attractions). Then we drove to Asteroga Ale House, because we were hungry and wanted food. After re-fueling we went to Valley Wine and Liquor for a wine tasting. I do like to try new things. After that, we were ready for the bra off (me) sweats on (both of us), TV watching portion of the evening. We are looking at an obscure offering called Stalking Santa (2006). We found it when one of the local movie rental places went out of business (oh how I miss movie rental places!). I highly recommend it. I guess this blog is about to become All Christmas All The Time, but is that such a bad thing? If so, comment, please, and let’s have a discussion. In the meantime, Happy Friday. Posted in humor, Lame Post Friday, local business, personal and tagged Asteroga Ale House, blog post, blogging, Christmas, Click's Cakes, European Deli, herkimer county historical society, herkimer ny, lame post, Rose Quartz Stand, Stalking Santa. Bookmark the permalink. I did not have to go to work today (don’t hate), so Steven and I headed to Little Falls for some local shopping at a few fun, distinctive places. I know I said I was not going to talk about where I shopped and what I bought who, but, well, I took a few pictures and I need a blog post today. Anyways, maybe I didn’t buy anything. Oh, OK, I bought a few things, but they might have all been for me. I call myself Cindy Claus this time of year, but I am always the Evil Woman CinCin. No matter. On with the blog post. I saw on Facebook (a veritable font of information if you have Liked the right pages) that there was a Cookie Crumb Trail at Canal Place, one of the main shopping destinations in Little Falls (the other one is Main Street). Participating merchants were offering cookies, so one was encouraged to go from store to store. We started at Rochette, which now shares its space with Huckleberry Letterpress Co. Lots of great gift ideas! I told the lady behind the counter that we were following the Cookie Crumb Trail and I hoped to take a picture at each stop for my blog post. She nicely offered us a cookie and hoped to see the blog post (oh dear, I will share this to Rochette’s Facebook page, but maybe the post isn’t very good. I always worry about these things). 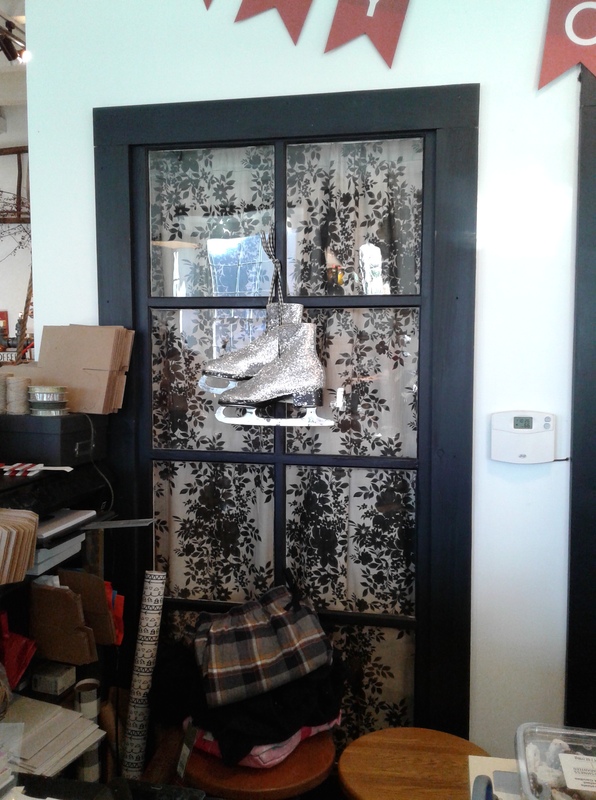 I decided to take my picture of a pair of ice skates covered with glitter hanging behind the counter. I saw a number of old ice skates for sale in the various antiques vendors’ spaces, so that is an idea I can steal (plagiarism is the sincerest form of flattery). She said they leave behind a trail of glitter but it is worth it. Next we went to Ole Sal’s Cafe and Creamery and through the different vendors in that area. 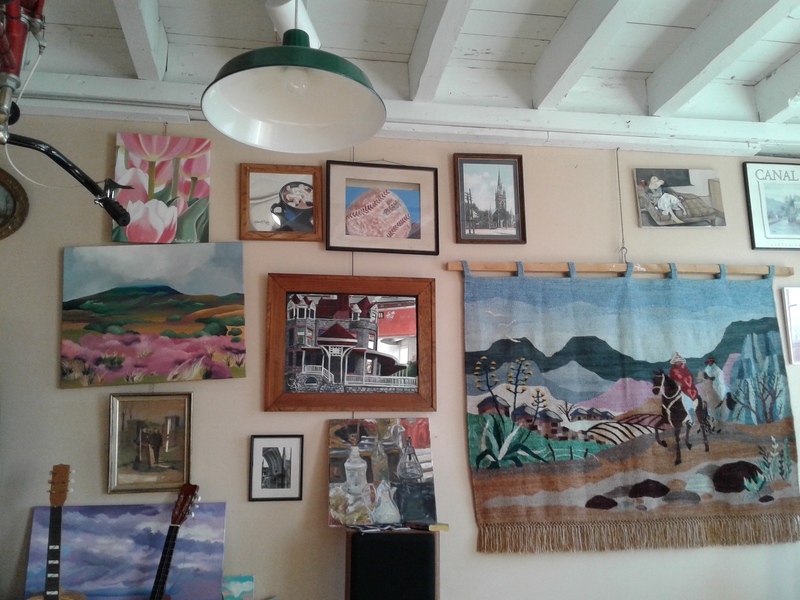 I took my picture of some local art on the wall. I don’t know how well you can see it, but my favorite is the mirror with the Overlook Mansion painted on it. When we went to the building next door, I could not get a picture, because my Tablet went into Selfie mode and I could not get it back. When we got to PrimaDonna’s Boutique, the nice lady there helped me. 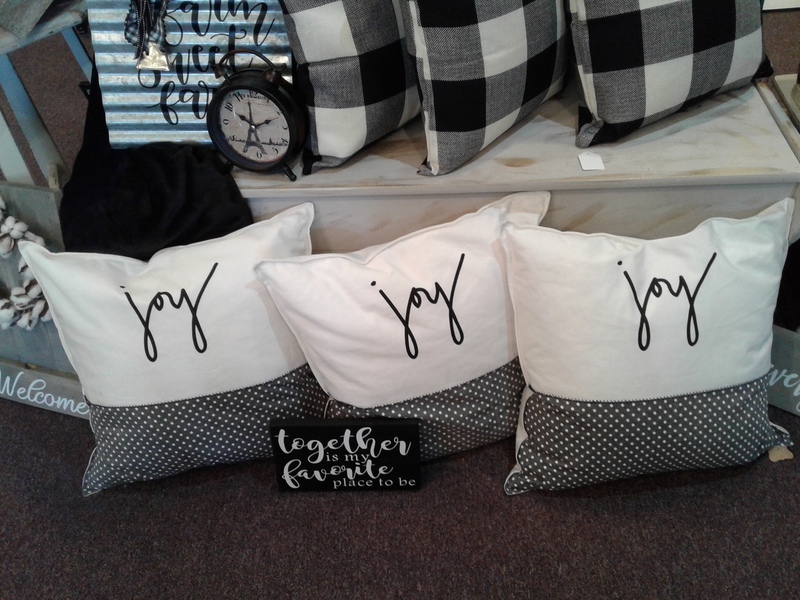 I happily took a picture of some pillows I liked, although there is a LOT in that boutique I admired. A soft pillow can bring one a lot of joy. After that we drove to Main Street, the other shopping destination in Little Falls, to Paca Gardens. I love walking around that place and touching the merchandise. So soft! 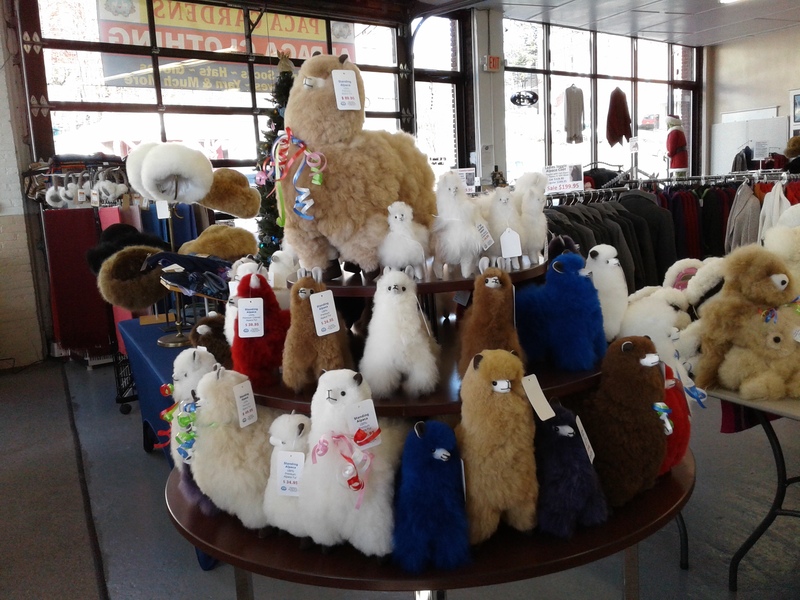 Of course I had to take a picture of some cuddly alpacas. There are other places to stop in Little Falls, as well as a few places in Ilion and Hekimer I had thought to hit for Christmas shopping. I guess I’d better charge up my Tablet and head out again tomorrow! Posted in humor, local business, personal and tagged blog post, blogging, Christmas, Christmas shopping, Huckleberry Letterpress, Little Falls Antique Center and the Shops at 25 West, Little Falls NY, Ole Sal's Creamery, Paca Gardens, Prima Donna's Boutique, Rochette, shop local, shopping destination. Bookmark the permalink. We had a gift exchange at my place of employment today. Eleven of us participated, and I got the best present. For me, anyways. My co-worker Joe is also a farmer. I’ve purchased peas in the pod from him (the only way I like peas is raw straight from the pod). I had forgotten he also grew popcorn. Oh dear, this is a very boring post. I had meant to tell the whole story about the gift exchange. We all drew a number. When it was your number, you picked a present and opened it. Or you could steal a present somebody else had already opened. There was a $5 limit on gifts. There were several scratch-off lottery tickets. When it was my turn, I picked the biggest present. It was heavy! “It’s probably a brick and a scratch-off,” I said. It was a shoe box stuffed with newspaper and… the popcorn! I said, “Please, nobody steal it, I really want this!” One fellow pretended he was about to, but he nicely took something else instead. I kept saying I was very excited to get popcorn, which of course I was. Joe told me the popcorn is organic and that it pops big and white. I’ll have to make another blog post with pictures when I pop some, probably this weekend. Later I asked where people could get the popcorn, so I could tell my blog readers. He said they could call the number on the label, or it was available at, “This store in Frankfort, it’s called…” he searched his mind for the name. So I get to plug The Locavore, too. As you may guess, they sell local products. The store is located at 159 E. Main St. in Frankfort. They are open 7 a.m. to 5 p.m. Monday through Friday, 10 a.m. to 2 p.m. Saturday. Yes, re-reading this I see it is kind of a boring post. I’m still excited about the popcorn, though. 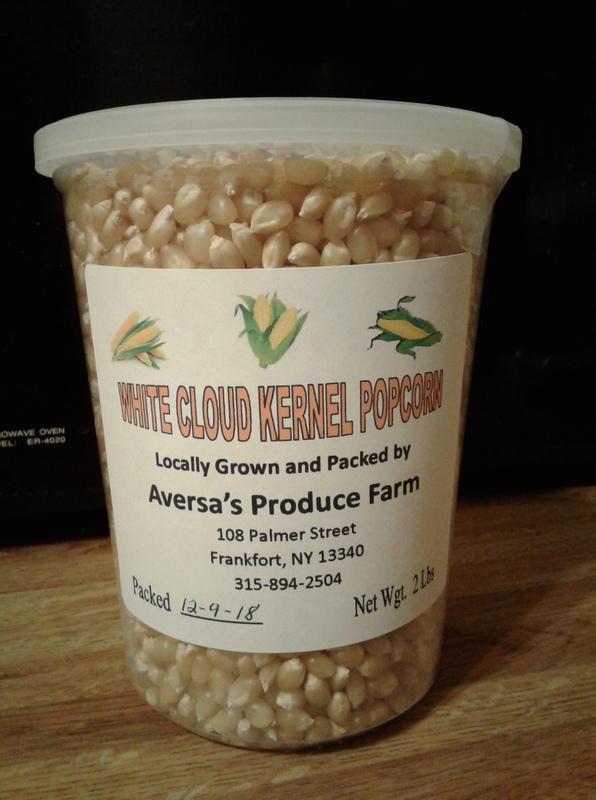 Posted in humor, local business, personal and tagged Aversa's Produce Farm, blog post, gift exchange, local produce, organic popcorn, popcorn, The Locavore. Bookmark the permalink.